Hi, I’m Beth, a member of Jody’s CF (Care and Fundraising) team. I’m excited for you to join us for a fun day to celebrate Jody’s new lungs and support his family financially during this expensive first year post transplant. Enjoy food from local businesses, enter to win prizes, bring your kids for family fun, and bid on your favorite items. Join us on October 11th at Lancaster County Christian School, Leola campus (2390 New Holland Pike, Lancaster). Activities Include: face painting, outdoor bounce house, pumpkin painting, cookie decorating, and fire truck exploration. A photo booth will be available for silly photos and an encouraging surprise for Jody. These activities are by donation. With a donation of at least $5 you will also receive a Journeying With Jody Benefit Bracelet. Light refreshments will be available for purchase. Items include Coffee Company coffee, Kunzler hot dogs, Dominion Pizza, Herr’s Chips, drinks, and sweets. Items include children’s items, gift baskets, jewelry, household items, services, gift cards, and consignment sports memorabilia. Featuring a signed copy of Marie Monville’s book, One Light Still Shines: My Life Beyond the Shadow of the Amish Schoolhouse Shooting, accompanied by a 1 hour speaking engagement. If your church, organization, or conference is seeking a speaker who will inspire and bring hope, Marie is it! Bid on items including vacations, furniture, home décor, work by local artisans, and unique experiences perfect for a night out or a family adventure. Highlights include a swing set donated by Swing Kingdom, a gas grill donated by JB Zimmerman, and autographed items donated by the Philadelphia Flyers. Absentee bidding is available for some items. Contact jamie@supportjody.com with inquiries. *Child Care available during the live auction for children ages 1 – 5. Purchase raffle tickets and enter to win a $100 Shopping Spree at Rockvale Outlets. We will also raffle a $35 gift card to the Olive Garden. 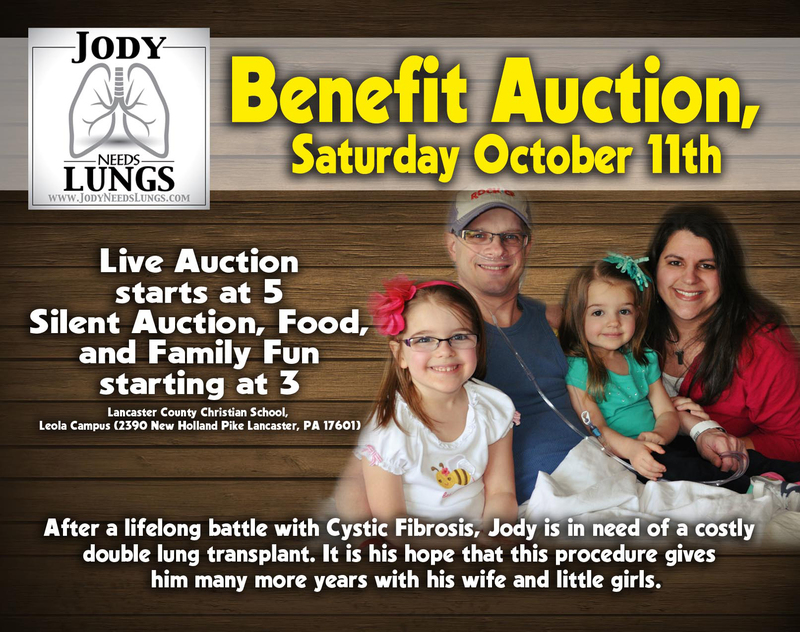 To be eligible to win you must RSVP on the Jody Needs Lungs Auction Facebook Page that you will be attending the auction. Non-Facebook users can comment below with their RSVP of attendance. You must be present at the auction during the drawing to win this raffle. Journey with Jody t-shirts will be available for purchase at the auction for $20.00. Pre-ordered shirts can be picked-up on the day of the event. Debit/Credit accepted through our YouCaring website at checkout. Check/cash preferred when possible. Whether or not you are able to attend Jody’s auction please ‘share’ this event with those you know and encourage them to come out in support of Jody and his family. We look forward to seeing you on October 11th. It’s going to be a great time for everyone! My family and I are coming!! Did I miss the information on how to pre-order the T-shirts? Looking forrward to attending the auction…..